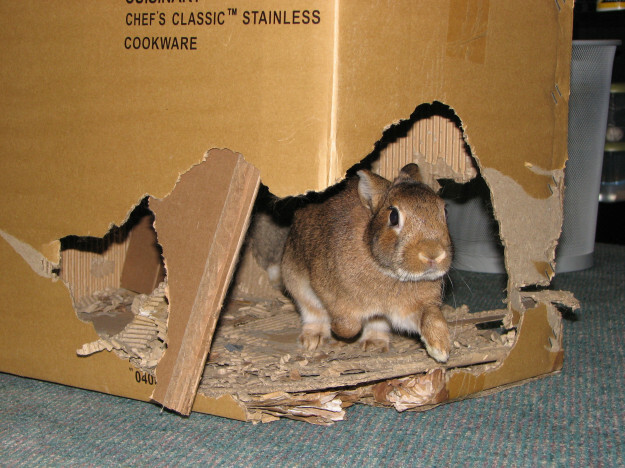 Building a cardboard castle for your pet bunny is an easy, inexpensive way to keep him/her busy. Your bunny will spend hours on “renovation”, chewing new doorways and taking down walls. The ideal box is large enough for your rabbit to move around in, but not so tall that he/she cannot jump onto the top to play as well. Remove any excess tape from the box as it can get caught in your rabbit’s fur. To create the most simple castle use your scissors or utility knife to cut two or more openings in the box. The openings should be appropriately sized for your rabbit. To create a more elaborate castle you can line the bottom of the box with extra pieces of cardboard or an old phone book to give your bunny more to dig. You can add a smaller box or paper towel tubes for your bunnies to push and rearrange. Cut additional pieces of cardboard to fit the inner walls. Secure these pieces by pushing untreated sticks of wood through the walls. Create a larger castle by combining two or more boxes of different shapes and sizes. A large box can be joined to a smaller box to create two rooms for your bunny to hang out in. You can add additional levels to the castle by securely placing one box on top of another. Add ramps for your bunny to climb to the next level. 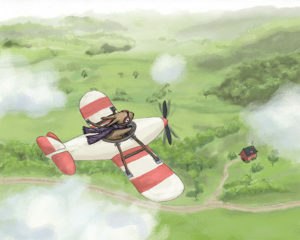 Use your imagination and soon you’ll have made your bunny’s new favorite plaything.